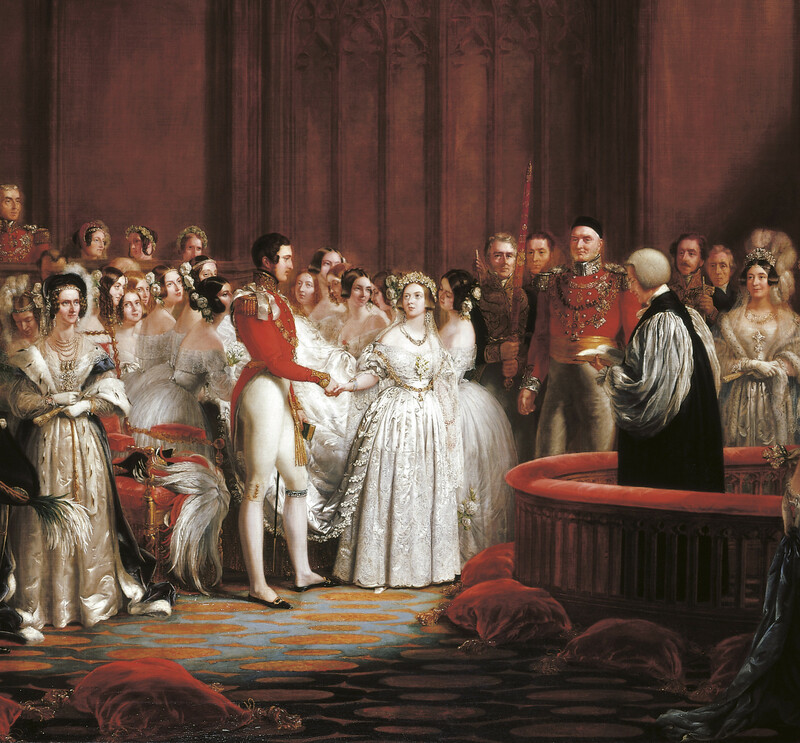 The ceremony took place on the morning of 10 February 1840 in the Chapel Royal, St James's Palace. Queen Victoria and Prince Albert clasp hands at the altar rails, before the Archbishop of Canterbury. The Queen had been pleased with Sir George Hayter's painting of her Coronation (RCIN 405409) 'which we thought a fine thing', and commissioned him to paint her marriage, in particular the moment of the joining of hands. Hayter had been to see the Chapel Royal a few days before the event, and sketched hard before and during the ceremony. Preparatory drawings survive in the British Museum. As in his Coronation, Hayter decided to alter dramatically the setting of the ceremony from what it actually looked like. The tall Gothic canopy and the panelling below are invented and only the details of the huge door behind the bridal pair may have been suggested by the much smaller door at the entrance to the Chapel Royal. Hayter included portraits of 56 of those present at the occasion and sittings took place over the next year. The Queen sat for him in March in her 'Bridal dress, veil, wreath & all', and Prince Albert also posed for his portrait several times during the following months. Hayter's family too helped out with his son, Henry, modelling the Prince's costume, while his daughter Mary posed for the Queen's arm and wearing the veil. Victoria's aunt Queen Adelaide, however, was unwilling to co-operate and the artist had to refer to a miniature for her likeness. Hayter included himself in the painting, on the lower right, with his sketchbook and pencil. By the end of the year Hayter was committing himself to a third large picture of the Christening (RCIN 403501) of the newly-born Prince of Wales, and Prince Albert said that the Marriage picture should be hung at Windsor during the festivities. When Hayter went to see it, however, he was disappointed as it was hung between windows with its back to the light, unlike the new portraits by Winterhalter which were hung in a beautiful light. The artist returned to London 'heavy hearted'. A number of copies of the Prince's head and of the Queen's were made in miniature for enamels to be set into bracelets for friends.